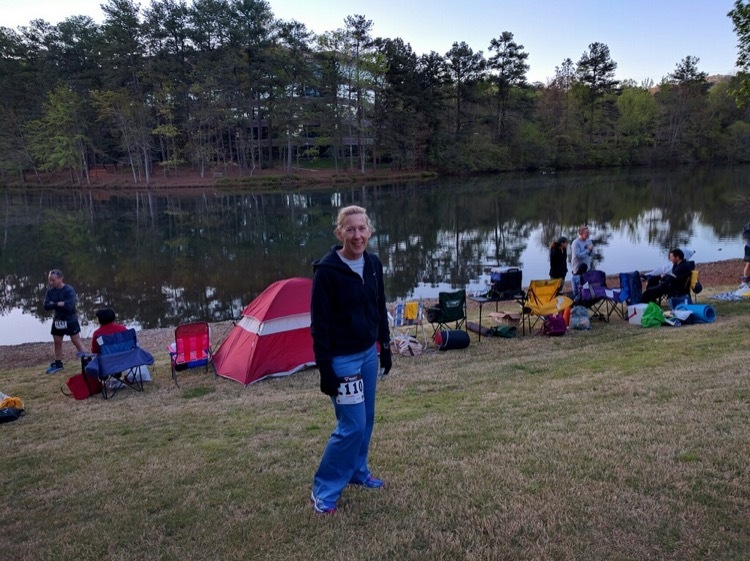 Author Jennifer Bonn before her first ultra. My experience with ultras began several years ago, when a friend convinced me to do a loop ultra. Her husband runs ultras as if they are a walk in the park, but to me it seemed like an insurmountable feat. She said, “This race is really chill, you run for as long as you can, and when you have had enough, you just stop.” Now, the problem with that is I am too competitive, and although I’m not an elite athlete who has a shot at winning, I want to be able to at least put in a good performance. I went to the race and was immediately hooked, although I quickly realized that I had a lot to learn. During the first race, I asked the veterans a million questions, and I continue to do that at each race. When I go to an ultra, I compete with myself, and I am fascinated with trying to figure out what is needed for success. I have been playing with nutrition, hydration, clothing, and ways to avoid injury. I realize the title for this article might seem negative, but my experience with ultras has been that each mistake I make teaches me something new and brings me a little farther than the last race. Let me list my mistakes and what they taught me, in the hopes that you can avoid making the same ones. The day of the ultra is not the time to drink something new. Drink what you have been training with. I thought it would be a good idea to drink a sports drink during my first race, even though I never drink it when I run. It tore up my stomach and did a number on my gastrointestinal system, which meant I spent a lot of time in the bathroom. I have discovered that around hour seven, I would give my right arm for a hot coffee and after drinking it I feel slightly normal again. The same rule applies for food. Stick to what you are used to eating. An ultra is not a good time to experiment with food. It’s generally a good bet to eat what the race organizers are offering. I cannot eat gels, so my food of choice is peanut butter and jelly sandwiches or Payday bars. A ultra veteran told me that I needed to eat something every hour, even if I wasn’t hungry. During one race I lost my appetite, so I stopped fueling. I hit the wall so hard that I didn’t feel like I could walk another step. I was lucky that a friend was with me to help me pack up my car. Keep eating! Pickle juice really does work to keep muscles from cramping. If you cannot make yourself drink the juice, eat a pickle or two. You may not want to see another pickle for a while, but your muscles will feel so much better. An ultra experience will be better if you have someone there to help with fueling and general support. I asked my husband to help me. He agreed, but did not want to be there for the entire race, so he asked me to give him a schedule of when he should come and what he should bring. My requests were modest: two coffees at the five hour mark as well as a Subway sandwich. He showed up with both, but instead of taking the easy path around and down to the loop, he came down the super-steep slope, both coffees went flying, and he landed and slid on the sandwich. I am laughing now as I write this! It was humorous even then, but I was really looking forward to those coffees! I had a friend who saved me by showing up around hour eight and pushed me to keep going. Being able to talk with a friend made the time go by quicker. When it became dark, I realized that my headlamp was not bright enough, but thankfully my friend Carl had brought a lantern that he carried until I was ready to stop. 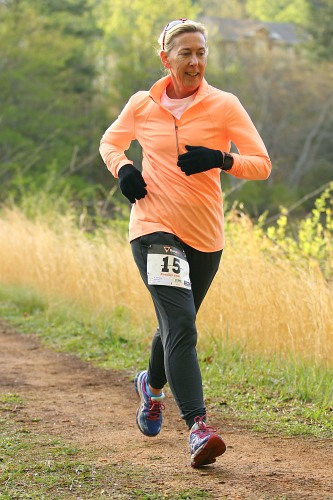 Jen Bonn running the Miles for Maria ultra. I broke probably the best known rule of running, which says don’t ever wear something new to a race, especially an ultra. My husband worries about me when I race, so he made me promise to wear rain gear on a day that was supposed to be very stormy. I never wear rain gear…ever. The rain pants on top of a pair of running pants that were also new, caused chafing that I wince just thinking about. Try everything out before race day. Good socks are important as well. I like Balega, because of the thickness, and I wear two pairs to help prevent blisters. During my first ultra I wore the wrong shoes and socks, and ended up losing three toenails and sporting some nasty blisters. It’s a good idea to have an extra set of clothes, socks and shoes if you are able to change. There are a few things that you can do before the race to ensure that you will be more comfortable. Put Vaseline wherever you may chafe. I put some under the line of my sports bra, since I once had a line of blood where it had rubbed me raw. I use Run Goo on my feet to prevent blisters. I also take some Pepto Bismol before I start, and I have tablets to help settle my stomach while I run if I need them. I over prepare, because you never know what you might need. I take bug spray and sunscreen, and bring a lot of my own food. I have a good breakfast before the race and try to stay off my feet as much as possible the day before. Your mental strength is important no matter what race you are doing, but it is crucial when you have to keep going for hours while your body is telling you to stop. You will hit at least one mental wall, but ignore it and break through. Try to distract yourself by talking to someone new, or refueling. Besides your shoes and clothing, the only thing you absolutely have to have is a headlamp if you are running at night. Make sure you try it out before the race. I think a small medical kit is a good idea, and most people bring a cooler with drinks or food that they prefer. Some runners set up tents and tables with gels, drinks, and food set out for easy grabbing as they run by. Be prepared for temperature changes. Of course if you are not doing a loop, find a good hydration system. I hope my mistakes will lead to your success. Get out there and give an ultra a try. I will continue to ask questions, make mistakes, and learn. Hopefully, I can keep pushing through to new mileage goals. Good tips! I’d even add that two lights, a headlamp and a handheld lamp are ideal. Especially in technical races where the terrain can be sketchy, or include switchbacks. Two lights give you better depth perception. Also, (this is a personal preference) I LOVE Injinji toe socks. Since switching years ago, I have never had another blister. They’re amazing. The only downside is if you need to change them for whatever reason, (long ultras, or after creek crossing, etc.) they can be a little more difficult putting on. I suppose that’s where good support comes in play! Good article; basic stuff you sometimes have to learn the hard way. Since my 1st 50k in ’81 I have learned something new at each race! You never stop learning about yourself in this crazy sport!